Laboratory balances from PCE are well-known for their high resolution and accuracy. Weighing plates of the laboratory balances consist of stainless steel. A tarring function can often be used. All laboratory balances are available with ISO calibration certificate or verification certificate (or with both). Laboratory balances can be used in laboratories, production / manufacturing, quality control, etc. Laboratory balances possess many functions such as: prescription preparation, tablet counting, percent calculation, etc. Many types of laboratory balances can display different measurement units such as mg, g, and kg. Major advantages of these laboratory balances are their small size and usability as well as their high resolution and wide weight range. PCE also offers paper balances for laboratory purposes. Paper balances are high precision/resolution devices for the determination of the basis weight (in relation to a square meter of a material). This is the most accurate way to determine basis paper/tissue weight. These laboratory balances are available with 2 or 3 years guarantee (depending on the model). If you have any questions about laboratory balances, please contact us at or Phone: +44 (0) 2380 987 035 for PCE Instruments UK, or or Phone: +1 (561) 320-9162 for PCE Americas Inc. The Laboratory Balance PCE-BS 6000 is a light, rugged precision balance suitable for different purposes. The removable stainless steel pan allows the laboratory balance to be cleaned easily. The Laboratory Balance PCE-BS 6000 can be used for weighing as well as for piece counting. The Laboratory Balance PCE-BS 3000 is a light, rugged precision balance suitable for different purposes. The removable stainless steel pan allows the laboratory balance to be cleaned easily. The Laboratory Balance PCE-BS 3000 can be used for weighing as well as for piece counting. The Laboratory Balance PCE-BS 300 is a light, rugged precision balance suitable for different purposes. The removable stainless steel pan allows the laboratory balance to be cleaned easily. The Laboratory Balance PCE-BS 300 can be used for weighing as well as for piece counting. PCE-DMS 200 is a laboratory balance for paper basis weight used to accurately determine the GSM basis weight (in relation to a square meter of material) of paper, cardboard, fabric, textiles and more directly in g, g/m², oz or oz/yd². PCE-WS 30 is an accurate and affordable laboratory balance or tabletop scale. Featuring adjustable feet and a built-in water bubble level, this benchtop electronic balance ensures precision with a full 100% tare weight range. PCE-WS 30 has a compact design and can be powered by the electric power adapter or the internal battery, making the scale portable when necessary. The robust laboratory balance is a real all-arounder. The stand of the laboratory balance can be easily separated along with the tripod mount from the platform and possibly sunk into the workbench. The cable between the platform and the display has a plug attached and is about 1.6 m long. The robust Laboratory Balance is perfect for all general weighing tasks. The stand of the Laboratory Balance can be easily separated along with the tripod mount from the platform and possibly mounted on the workbench. The cable between the platform and the display has a plug attached and is about 1.6 m long. P1 is 400 x 500 mm size. PCE-PCS 30 is a laboratory scale or balance with accurate weighing and piece or part counting functions. Ideal for use in laboratory, office, inventory and miscellaneous industrial applications, this portable scale can be powered by battery or by the included electric power supply. The scale's built-in RS-232 port enables data transfer and printing. PCE-PCS 6 is a laboratory scale or balance with accurate weighing and piece or part counting functions. Ideal for use in laboratory, office, inventory and miscellaneous industrial applications, this portable scale can be powered by battery or by the included electric power supply. The scale's built-in RS-232 port enables data transfer and printing. The robust laboratory balance is a real all-rounder. The stand of the laboratory balance can be easily separated along with the tripod mount from the platform and possibly sunk into the workbench. The cable between the platform and the display has a plug attached and is about 1.6 m long. KB 1200-2N is a digital benchtop laboratory balance or scale offering a high level of precision as well as features such as percentage determination, GLP record keeping, recipe, piece counting, pre-tare, suspended weighing (hook not included) and vibration-free animal weighing functions. Complete with freely programmable weighing units (e.g., direct display of thread length (g/m), paper weight (g/m2), etc. ), this laboratory balance supports a wide range of applications in pharmaceutical, dental, food, veterinary, jewelry, textile and printing industries and beyond. Laboratory Scale PCE-BT 200 to be used in Laboratories, production, quality controls, etc. Some important aspects of the Laboratory Scale are both its design consisting on a flat surface and also it is very easy to use. It small size together with its high resolution in wider weighing ranges are other advantages of the Laboratory Scale PCE-BT 200. Laboratory Scale PCE-BT 2000 to be used in Laboratories, production, quality controls, etc. Some important aspects of the accurate balance are both its design consisting on a flat surface and also it is very easy to use. It small size together with its high resolution in wider weighing ranges are other advantages of the Laboratory Scale PCE-BT 2000. The Laboratory Balance PCE-TB series is characterised by a wide range of applications. The scale features a bi-directional RS-232 interface and USB interface. The Laboratory Scale is a high precision / resolution device for the determination of the basis weight (in relation to a square meter of materials). This is the most accurate way to determine basis paper / tissue weight.The Laboratory Scale displays the basis weight of paper, tissue, fabrics ... directly in g/m² with 0.1 g/m² (0.001 g) resolution. Verifiable waterproof Laboratory Balance in stainless steel with separate indicator (no corrosion). The multifunctional Laboratory Balance is manufactured to IP67, dust-tight and thus can also be temporarily submerged completely under water (up to 1 m depth). Verifiable waterproof Laboratory Balance in stainless steel with separate indicator (no corrosion). The multifunctional scale is manufactured to IP67, dust-tight and thus can also be temporarily submerged completely under water (up to 1 m depth). Scales and balances have become a must-have instrument which finds its application almost in all spheres of life: at the enterprise, at the store or market, at home, variety of manufacturing companies – anywhere where the goods / materials / substances should be weighed. Since there are numerous fields of application, there are lots of types of balances which may be better and more suitable for this or another purpose. Mostly all laboratory scales used today are electronical, possessing sensors and lighted display for convenience. When it goes about laboratory, it is clear that approximation does not count and all the measurements should be as precise and accurate as possible. The first thing to remember is that it goes about accuracy and this should not be underestimated. Connected with this point is also specialization of the laboratory, because depending on what kind of tests and experiments are carried out there, the laboratory balances applied may also differ. In general, the laboratory balances may be analytical (with the highest precision class 1, 2), technical, microbalances, top loading balances and others. There is simply no point to take the highest precision analytical balances for weighing materials where the highest accuracy is not necessary. Thus, for example, in metallurgical, heavy industries, agriculture, partly chemical and food industries, the laboratory balances weighing is often carried out not in the perfect ideal conditions (dust, vibration, wind) and the analytical balances may just be not the best choice. More robust models providing smaller accuracy, but provided with additional auxiliary equipment (weighing platform, windscreen, removable weighing pans) may serve for weighing samples of hot substances, oil, coal products without being damaged or broken. They are easy to maintain, clean and calibrate due to the automatic calibration function. In their turn, analytical balances are mostly used for especially precise measurements, where not only gram, but hundreds of a gram count. This applies mostly to pharmaceutical and medical sphere (preparation of solutions, testing of new substances, mixing of various component), jewelry production, chemical laboratories, food / beverages production (creation of new tastes and flavors), criminalistics etc. The requirements to this type of balances are very high and that is why these analytical devices should fully comply with the regulations of ISO and GLP. Depending on the accuracy a certain laboratory is certified for, the equipment used in this laboratory is strictly controlled. Compliance with all the requirements is important not only for the laboratory where the experiments are carried out, but at all the further stages the product goes through: developing, processing, manufacturing, packaging, storage… The main goal is – the final product which in this or another way reaches the customer should correspond to the existing required standards. That is why GMP (Good Manufacturing Practice) or BRC Global Standards, which, principally, monitor and control that the producer observed all the rules at any stage the product goes through, in order the customer / consumer received qualitative product, set very high requirements which are obligatory for fulfillment. To use these balances, the perfect conditions must be provided: absolutely clean air, no contaminants, like dust or particles of other substances, cleanness, absence of vibration, air flow, draft. If some of the parameters cannot be fulfilled, like very clean environment, the balances need to have a special protection class, which correspondingly prevents contaminants from getting inside and influencing the measurements. It mostly goes about weighing samples of bulk or liquid test reagent, chemical agents with the purpose to determine very precise weight, up to 5th decimal place. This type of balances may be used only be the trained personnel and the equipment should be installed on a special anti-vibration laboratory table, so that any possible influence on the measuring process was excluded. Nowadays, the latest models of the laboratory scales possess a special interface – this feature provides the connection to the computer and a very good possibility to process and analyze the results of the measurement at once. All the data are stored and the influence of the human factor is almost brought to zero. Due to the software, the data cannot be confused, misread or lost, and almost all necessary calculations are carried out automatically. Laboratory balances must be calibrated regularly, especially the analytical ones, in compliance with the directives concerning quality control. The slightest changes in the environment (temperature, humidity, air moves, pressure) are likely to affect the weighing equipment and thus, to ensure perfect measurement results. Calibration may be external and internal, can be carried out manually by the trained operator or automatically, if there is such a function available. Laboratories that comply with ISO/GLP or GMP are recommended to carry out external calibration daily to avoid measurement errors of any kind and to ensure high precision. So, when choosing an equipment for the laboratory one of the most important issues to make clear is the necessary accuracy and the field of application. After making it clear what the minimal weighing limit of the scales should be and what types of substances should be weighed and under which conditions, the suitable type of the balances should be selected. One more point to remember is that accuracy and precision of the balances are not synonyms and accurate not always means precise. Though accuracy is very important since it shows the correspondence to the real value, it is also vital for the laboratory scales to be precise (which means the measurements are repeatable), because it is much easier to adjust the balances in case of an error. 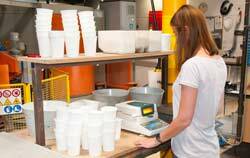 High accuracy is a feature that any customer expects from their weighing equipment. Depending on the function of the laboratory balance, the required accuracy levels may differ from the expectations of the user. There is no place for measurement errors in the lab since the tests and experiments must be carried out with high precision. Weighing is one of the most fundamental procedures performed at any medical or scientific laboratory. For many modern laboratory scales, precision is vital and they must additionally possess features such as averaging, control weighing, piece-counting, and percentage weighing that makine them indispensable devices for researchers. Laboratory research is often performed using small weights as well as various ingredient mixtures and materials. Therefore, the laboratory balance must be able to offer the smallest readability with numerical precision to the required decimal digits. 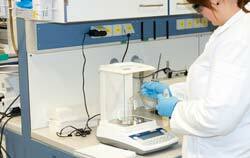 Each laboratory must determine the minimum requirements and capacity needed for their application as accuracy and readability is one of the influencing price factors with laboratory balances. Precision lab equipment should be protected from any possible harmful elements including dust, wind, and vibration. Certain laboratory balances and weighing platforms,, are equipped with various auxiliary enclosures to provide full dust, wind, and vibration protection for the device and the material being weighed. A modern, digital laboratory balance allows you to switch between different measuring units as well as utilize connectivity through a PC or other devices. Connectivity allows the user to see readings in real time, the capability of keeping a record of weighings or experiment logs, as well as easy preparation for detailed reporting. Depending on the type of laboratory and its required equipment, the scales may feature components such as an internal calibration function and overload protection. These functions are designed not only for continuous accuracy, but to protect the units internal systems. If a laboratory operates in compliance with the ISO or NIST requirements, government regulations, and specific industry standards, the operator must exercise particular care and observe specific rules to guarantee the scales and balances operate as designed. Laboratory equipment requires periodic care and maintenance due to its high sensitivity and precision accuracy.